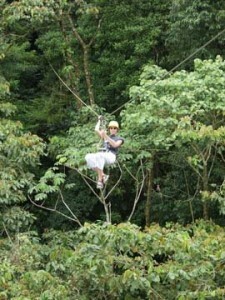 Rates: $89 USD per person. Children 3-8 years old. $70 USD. 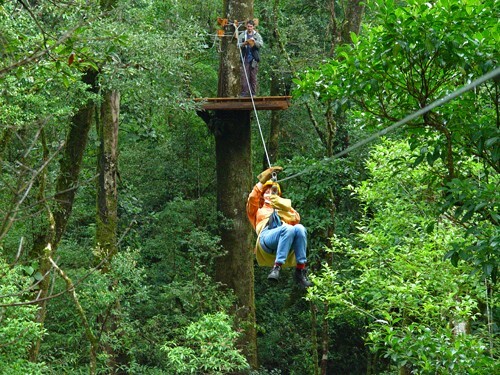 Set into the placid cloud forests of Costa Rica’s Central Valley region, the San Luis canopy tour will take you on an exhilarating and safe adventure through lush, green canopy and across the majestic Rio Cataratitas. Carried securely by a system of zip lines, you will soar weightlessly through the expanse of virgin forest that grounds the tour, and find yourself in intimacy with the habitats of Costa Rica’s distinct cloud forest wildlife. The San Luis canopy tour also presents the “Elevator”, a thrilling feature that securely lifts visitors high above the forest canopy, granting a paramount view of the surrounding area. What to Bring: Walking shoes, insect repellent, sweater. Return details: Returns to original departure point at approximately 4:30pm.